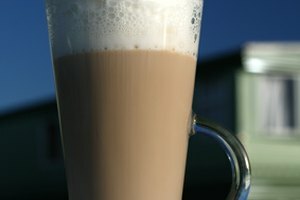 Coffee essence is a form of concentrated coffee that is regularly used in iced coffee drinks in coffee shops and restaurants. While adding ice or water to coffee brewed at double strength is a more common method of making iced coffee, coffee essence is more economical and much faster after the initial batch is made. 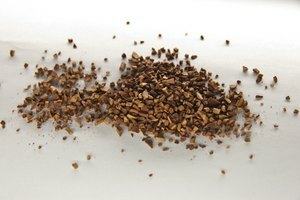 This recipe makes 10 cups of coffee essence, but it can be cut in half or doubled as necessary. Grind 1 1/4 cups of coffee to a medium grind in a burr or blade grinder. Measure the ground coffee in a measuring cup to make sure that it totals 1 cup. Remove some coffee or grind more as needed to make 1 level cup. 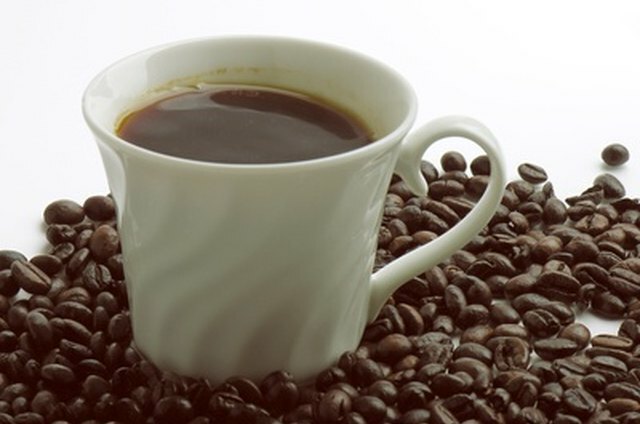 Transfer the ground coffee to a heatproof container large enough to hold 10 cups of water. Bring 10 cups of cold, clean water to a boil in a teakettle. Transfer the boiling water to a heatproof container and allow it to cool for 90 seconds. 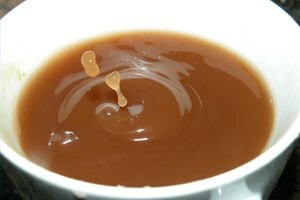 Pour the water over the coffee grounds and stir with a wooden spoon or spatula for 30 seconds. Cover the container with a tight-fitting top and allow the contents to steep at room temperature for 12 hours. Strain the coffee essence into a large container through a fine-mesh sieve. Discard the coffee grounds. Store the coffee essence in the refrigerator in a container with a tight-fitting top for up to 14 days. You can freeze coffee essence in ice cube trays to add to iced coffee to avoid diluting it with regular ice cubes. If you want sweeter coffee essence, add 1/4 cup simple syrup to the coffee essence after straining and stir for one minute to combine. Don’t let the coffee steep for more than 12 hours. The coffee essence may take on a slightly bitter, acrid flavor after more than 12 hours.